“I see it as a political act, actually – getting in touch with my own body,” she tells me over Skype. As with all things, I can only approach artist Rosanne Robertson’s recent output from my own position: that of a 28-year-old cis woman with a body. A body which, like any woman, I have and always will have a difficult relationship with. 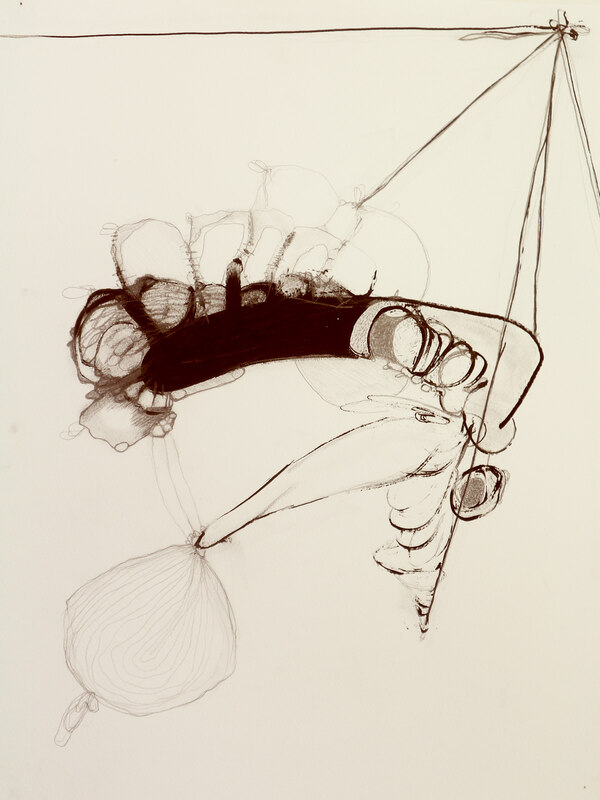 After several years of making improvisational sound-based performance, Robertson has increasingly begun to move away from the intensity of the live space; returning to drawing as a way of slowing things down and physically stepping outside of her work. Yet she remains very much within it. Her recent exhibition at PAPER, Slipping. Suspended., filled the small space with body. With large, visceral, unapologetic sections of torso isolated against a psychologically-charged charcoal-black background; shown alongside several more intimate oil and graphite pieces from which the abstract suggestion of fragmented human form emerges. The first set are based on photographs of herself performing for the camera and found images of other women; the second set were made using a free, automatic method of mark-making. These drawings are not about bodies, but about the complex, messy, fluctuating experience of inhabiting one. The inextricable, if often down-played relationship between the psyche and the soma. “Something we almost can’t speak about,” Robertson adds. The amorphous connection is most apparent in the ‘pinned’ pieces, where strings, nerves and wires hold the image in a suspended, fragile state; evoking the impression of overriding flux. The same occurs in her sculptures, which look only just tied together; the joins and precarious methods of construction exposed. Rather than weakness, however, a generous sense of openness is what comes across. “Hopefully they offer a different sort of power” she asserts; “not being scared to share something more honest about yourself.” Coupled with this, they simultaneously encapsulate another subtle kind of resistance: “I see the smaller parts as opposing the idea of one totalitarian object or dominant structure; subverting the tactics of an egotistical, capitalist system.” Confounding the male gaze, perhaps. Though we discussed the complexities of mind/body experience for all people, Robertson stresses: “It’s very important to me that I’m handling female and gender queer form. It’s about reclaiming space that has been objectified and commodified.” She was pleased at the preview of Slipping. Suspended. to find that the work resonated with others there. For me, at least, the abstract drawings in particular give voice to an aspect of experience that is hard to put into words.